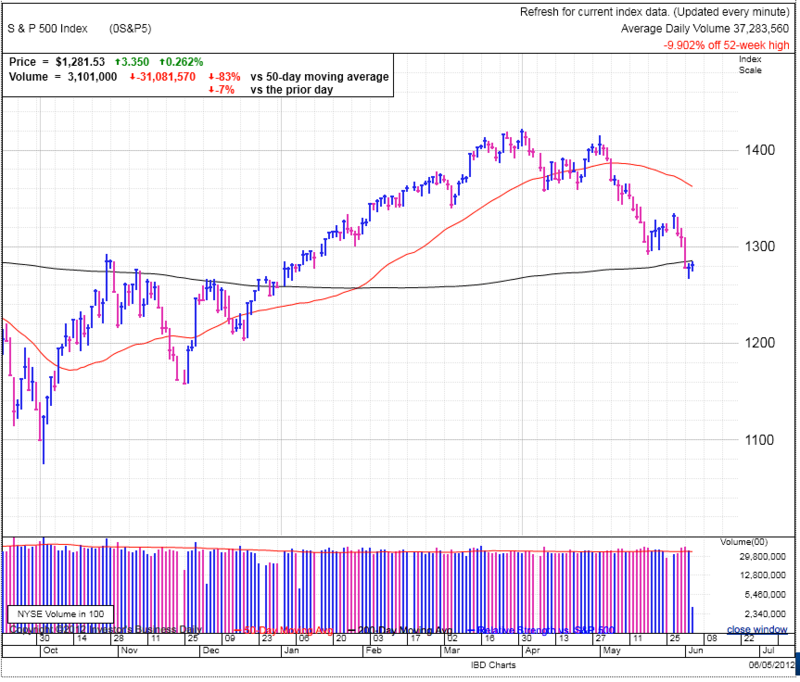 The markets continue finding support around their 200dma and so far arrested what could have become a cascade of panic selling after Friday’s jobs report. This is an encouraging sign the markets are taking a wait and see attitude to this economic weakness versus a sell first, ask questions later approach we’ve seen in previous plunges. The interesting thing about browsing major market news outlets is the complete absence of professionals saying this weakness is a great buying opportunity. From my highly unscientific survey, it seems many Wall Street traders are pessimistic about the current outlook. But being a contrarian, I find this is highly encouraging. The reason contrarian investing works is who continues holding stocks when they are convinced the markets are headed lower? So when everyone is bearish, it means they have already done all the selling they are going to do. If all the selling has already taken place, how much lower can we go? Thus what becomes the new path of least resistance? No doubt a nasty headline could take the knees out from under this skittish market, but as we are watching the markets digest Friday’s dismal jobs report constructively, at this stage in the game it appears there is not a lot of extra selling pressure left in the market and any additional bad news will also be more limited. It helps to think of market sentiment as a spring. Sometime it is extended and others it is compressed. A stretched market snaps back hard and fast, while a compressed market resists additional pressure fairly well. This is most likely why Friday’s jobs report hasn’t triggered a two-week slide like we saw last summer when the markets were trading near 52wk highs. As for how to trade this, now might be a good time to lighten up on any short positions, as the potential for a bounce is more probable than another leg down. This correction is pretty long in the tooth and fairly obvious to everyone; remember, traders who overstay their welcome always get stuck with the bill. Take your profits early and get ready for the next high probability trade. For those with an iron stomach, buying small positions could make for some excitement with limited risk as we wait for a more concrete follow through day. Speaking of which, given yesterday’s price-action, we are in day-two of an attempted rally. We could see a follow through as soon as Thursday if the markets have a strong up-day on higher volume. And keep in mind, the more reluctant people are to buy the follow-through-day, the more likely it is to work. While I’ve been pessimistic over previous follow-through-days, I’m fairly constructive on the next one given the extreme sentiment. No doubt we could see additional selling from here as anything is possible in the markets, but when looking at recent price action between the sell-off since April and the apparent support after Friday’s disappointing jobs report, it seem like the higher probability trade is now higher. But keep in mind there is a difference between a bounce and a sustained rally. Most likely we’ll move sideways in a trading range as the market digests the headline risks in front of us, but this churn is what clears the way for additional gains later in the year. In our current environment swing trading will be the best way to approach the market, meaning get in early and take your profits early. As I alluded to earlier in this post, I follow the financial news daily, but not in a traditional way where I am seeking trading advice or looking for the next big thing. I use the media to gauge sentiment by hearing what other traders are thinking. There are a lot of successful investors like Buffet and O’Neil who avoid the noise of Wall Street and have moved thousands of miles away from the crowd. But I’ve taken it to the next level and rather than simply ignore the noise, I actually sample it and use it to give me clues on group-think and clustering that present trading opportunities. This style is not suitable for most people, but I find it gives me an edge when trying to anticipate the market’s next move.